Gengar in game: 1,976 Who? Important notice! 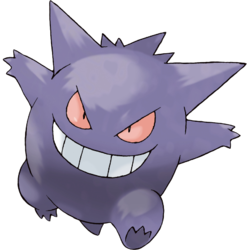 Pokemon Gengar is a fictional character of humans. 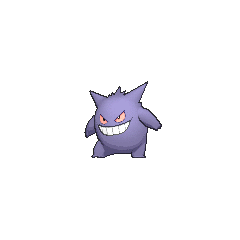 Gengar has the ability to hide perfectly in the shadow of any object, granting it exceptional stealth. However, Gengar's body acts as a heat sink. Its presence cools the temperature of the surrounding area by nearly 10 °F (5 °C), because it absorbs the warmth. 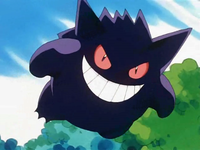 In addition, Gengar possesses the ability to fly through the air, as demonstrated in the anime. Gengar is very mischievous, and at times, malicious. It enjoys playing practical jokes and casting curses, such as pretending to be one's shadow, then behaving erratically. When the quarry notices, the Gengar takes delight in its victim's terror. 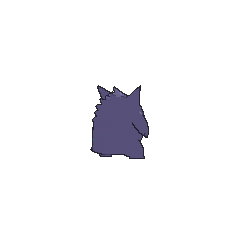 However, Gengar has been known to be loyal to a Trainer who treats it well. 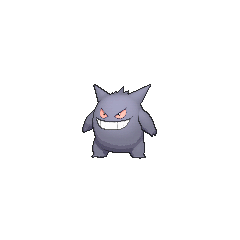 Gengar lives in shadows of rooms, caves, and dark places where shadows form. It is especially fond of urban areas such as cities and back alleys, but only during the night. Gengar appeared under the ownership of Ecruteak City Gym Leader Morty in A Ghost Of A Chance, From Ghost to Ghost, and For Ho-Oh the Bells Toll!. Agatha used a Gengar to battle Ash's Pikachu in The Scheme Team. The Ghost Pokémon defeated Pikachu. Ash first saw a Gengar in person in Lavender Town in The Tower of Terror while searching for a Ghost-type Pokémon to fight Sabrina with. Due to a close call, Ash got to spend some unexpected time with the ghostly trio, Gastly, Haunter, and Gengar. It, along with Haunter, seemed to have a fondness for Japanese stand-up, and attempt to (unsuccessfully) amuse Ash by acting as a pair of performers. It reappeared in a flashback in the following episode. In The Ancient Puzzle of Pokémopolis, a giant Gengar was awakened near the ancient city of Pokémopolis where it battled an equally large Alakazam. Drake of the Orange Islands used a Gengar in his battle with Ash in Hello, Pummelo! and Enter The Dragonite. His Gengar managed to confuse Ash's Tauros before he returned it and instead tried with Ash's Lapras. In the collision between Night Shade and Ice Beam, both Lapras and Gengar fainted. A Gengar appeared in PK15. A Gengar under the ownership of Hearthome City's Gym Leader Fantina appeared in a flashback in Playing the Leveling Field!, and appeared in A Shield with a Twist where it was defeated by Ash's Buizel. Three Gengar appeared in Celebrating the Hero's Comet!. Lon owns a Gengar that appeared in Scary Hospitality!. 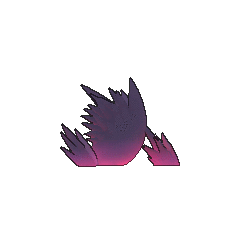 It is used by Lon, alongside its Gastly and Haunter, to scare visitors of the "Scary House". A Gengar was used by the ninjas that attacked the Ninja Village in A Festival of Decisions!. A Shiny Gengar owned by Alva that can Mega Evolve appeared in Volcanion and the Mechanical Marvel. Gengar first appeared in the opening of the first episode, Pokémon - I Choose You!, where it and a Nidorino battled in a Colosseum on TV as a reference to the original Pokémon Red and Green games. 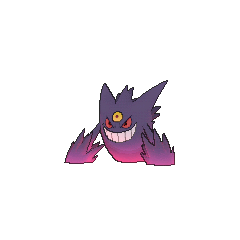 A group of Gengar, along with a group of Haunter, were composing illusions within a forest in Illusion Confusion!. A Gengar appeared in Beauty and the Breeder where it participated in a Pokémon breeding competition. A Gengar appeared in UnBEARable in Brock's thoughts. A Gengar appeared under the ownership of a Trainer in Celebi: Voice of the Forest. A Gengar appeared in Who's Flying Now?, in the Fortree City Feather Festival. A Gengar appeared in Ghoul Daze! together with its pre-evolutions, Gastly and Haunter. 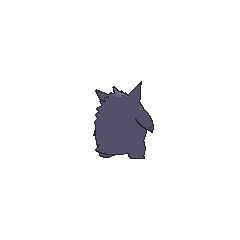 A Gengar appeared as a mask for the festival in Capacia Island UFO!. A Gengar that can Mega Evolve into Mega Gengar appeared in Mega Evolution Special I. A Gengar appeared in SM003, during a fantasy. EP072 Gengar Ash's Pokédex Gengar, the Shadow Pokémon. The evolved form of Haunter. Details about this Pokémon are unknown. DP102 Gengar Dawn's Pokédex Gengar, the Shadow Pokémon. Gengar hides in the shadows. If a Gengar is nearby, it is said to feel ten degreescolder than normal. Gengar appeared in File 1: Red battling a Nidorino. Agatha used a Gengar against Blue's Rhydon in The Challenger and lost. A Gengar appeared in the opening sequence for The Adventure, battling against a Nidorino. 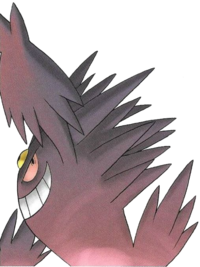 Gengar first appeared under the ownership of a Team Rocket Grunt in Holy Moltres where it was used to battle Blaine's Arcanine and Rapidash and almost attacked Red. 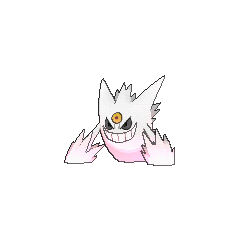 In Pokémon Adventures, Agatha has two Gengar on her team, and many in her Ghost-type army. Her first one and her Ghost army first appeared in Lapras Lazily. One of them was used to attack Blue and Koga from the shadows, draining the latter's life force as it possessed his shadow. Eventually, it was taken down when Koga used the tail that the old woman's Arbok bit off his own to distract it long enough for Blue's Porygon to deal the finishing blow. 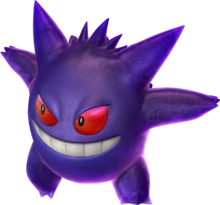 A Gengar was one of the Pokémon sent to help the fight in Ilex Forest in The Last Battle XIII. 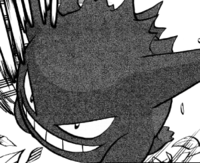 Another Gengar was seen at the beginning of the FireRed and LeafGreen saga in Volume 23. It was used by a kid from Pallet Town in an attempt to capture a Nidorino, thus replicating the opening sequence of the Generation I video games (and their remakes). In the X & Y chapter a Gengar belonging to Gurkinn appeared stopping Celosia's Aegislash from killing X. He helped battle against Team Flare to stop them from obtaining the tree form of Xerneas and later was given to X, where he was named Garma. Gengar is a playable character in the arcade fighting game. 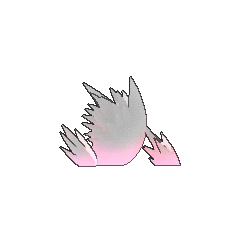 Moves it can use include Shadow Ball, Hypnosis, Shadow Punch, and Curse. Upon entering Burst form, it Mega-Evolves and can use the Burst Attack Shadow Drop. Pokémon Mystery Dungeon: Red Rescue Team and Blue Rescue Team: Gengar is the leader of Team Meanies. While often accompanied by Ekans and Medicham, Gengar will often act alone and spends much of the game causing trouble, even convincing the village to exile the hero, blaming him or her for the natural disasters. However, it is later revealed that he is the cursed human. It apparently wishes for a traveling companion. Since it was once human itself, it tries to compose one by taking the lives of other humans. If Foresight or Odor Sleuth is used by an opponent or the opponent has Scrappy, the effectiveness of Normal-type moves is 1× and the effectiveness of Fighting-type moves is ½×. 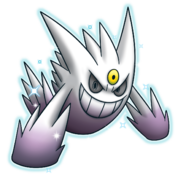 Mega Gengar has the highest base Special Attack stat of all Ghost- and Poison-type Pokémon. It also has the highest base Speed stat of all Ghost-type Pokémon. 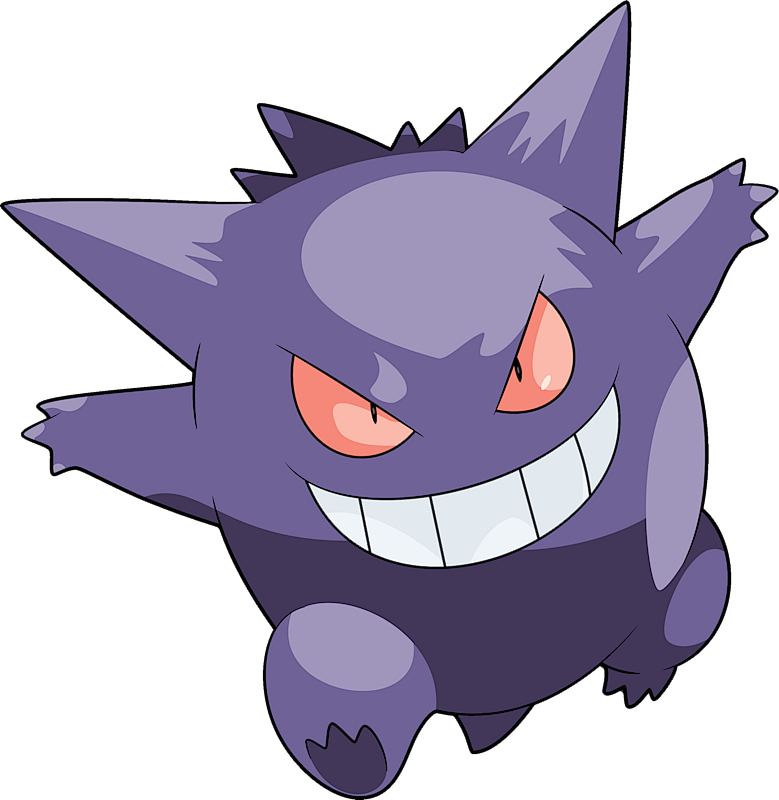 Gengar could be seen as a counterpart to Alakazam. They are both the last stage of a three-part evolutionary family, which can only be achieved by trading the second stage, both are capable of Mega Evolution, Gengar is weak against Psychic-type moves and Alakazam weak against Ghost-type moves, thus being weak and at the same time strong against each other. They are the same size, and get smaller upon Mega Evolution, sharing a base friendship is the same at 70. In the anime episode The Ancient Puzzle of Pokémopolis, a Gengar and an Alakazam are put against each other. Since Generation VI, they have a base stat total of 500, and are both weak to Ghost- and Dark-type moves. It seems to be simply based on general cartoonish ghosts, cats, or the Cheshire Cat and possibly on a distorted shadow of a human being like shadow people.